We stock Catalytic Converters for every application. Federal Catalytic Converters meet or exceed both OEM and USEPA standards and are intended for vehicles outside the state of California. Federal catalytic converters may not be sold or used on vehicles that are licensed in the state of California. California Catalytic Converters are CARB compliant and have been granted an Exemption Order(s) by the California Air Resources Board. 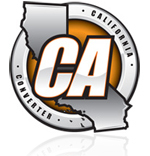 California Converters must strictly be installed in accordance with the application information provided. Enter the Make, Model and Year of your vehicle to find the correct Catalytic Converter for your needs. Rarely does a converter fail on its own. A catalytic converter is designed to work on a properly tuned engine. Converter failure is usually a symptom of an engine related problem upstream of the converter. The cause of a converter failure must be investigated and repaired to maintain a properly running vehicle. Proper diagnosis and repair of the conditions that led to converter failure are required. Failure to do so may lead to failure of the replacement converter and void the replacement converter warranty. Deciding on the proper universal catalytic converter for today's vehicles can be a difficult task.